Anyone can write a “hatchet job” article attacking a tech company — for awhile there, the daily Yahoo bad news was a running joke. 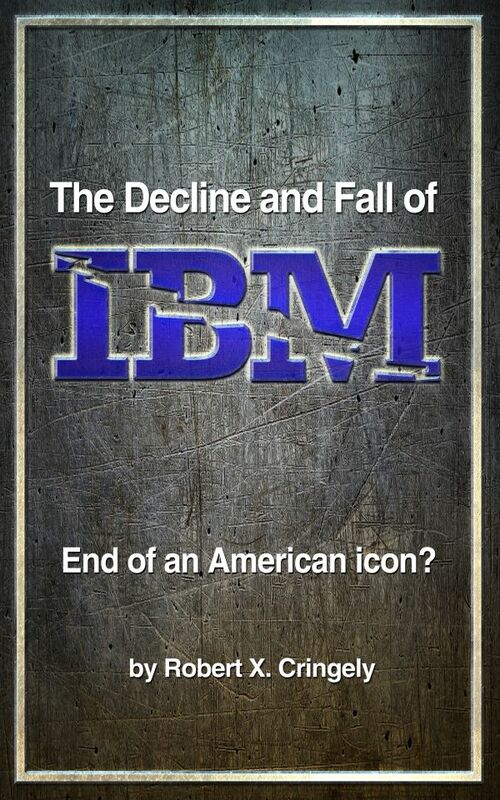 Robert X. Cringely’s newest ebook, “The Decline and Fall of IBM” is something entirely different. Cringely didn’t do it for the money; “Decline and Fall” is an ebook priced at $3.99. At the time he published it, he had a different, hardcover book contract with a publisher requiring their work be the next book Cringley would publish. With a heavy heart, Cringely returned the advance, worth hundreds of thousands of dollars, and put the IBM book into the world. This book is a labor of love. “Decline and Fall” is the work of a real journalist, investigating what had happened to a company he had once admired. A story of a love lost, the plot is all too familiar, full of outsourcing, layoffs, and incompetence. Sadly, it is familiar for a reason. The root of problem is a poison that is all too common in American business, and may be infecting your company as well. The main trick of IBM’s management, at least according to Cringely, was to convince the board of directors and owners that the primary measurement of the company’s success should be earnings, or profit, per share. This sounds reasonable, even fair. When we hear it, we expect to be sad, but don’t quite know how to respond when companies use layoffs to reduce cost by sending work to cheap-labor countries. This increases profit without having to increase sales … but that is not the heart of the story. If the company can buy half its shares, it can double earnings per share without increasing sales or lowering costs! As long as the trick works, the IBM executives can keep collecting their bonuses, Wall Street will be happy, and their stock will increase. Make no mistake, though: There is no innovation here, no creation of new value. Other companies that do innovate will get ahead of IBM, but IBM has decades of head start and brand to burn through. The idea of musical chairs with expenses combined with accounting shenanigans is familiar; it is the story of Enron and WorldCom and the previous generation of scandals, though this time it is apparently legal. Somehow, I suspect IBM is not the only company doing this; it is just the only one with a real investigative journalist following it to take notes. 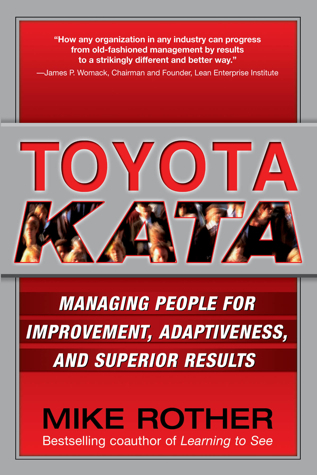 This talk of the decline and fall of titans reminds me of the other book on my reading list: Toyota Kata, which begins by comparing General Motors and Toyota. According to the author, Mike Rother, the General Motors of the 1950s and ’60s had a wide variety of project ideas, so they picked the most profitable, on a cost/value basis. This worked just fine, steering the company toward bigger, more profitable vehicles, right up until the early 2000s, where the easy pickings for profits began to run out. Toyota, meanwhile, had a different strategy: Figure out where you want to go, then figure out how to get there. The company saw that people wanted smaller vehicles (market demand) and realized they weren’t profitable, so they tried to figure out how to make them profitable. This strategy works in a more mature market, when competition is fierce and eking out a profit becomes increasingly challenging. Twenty years later, software development is becoming a competitive market. The outsourcing, downsizing, restructuring, consolidating, and other techniques we’ve seen to control costs is just another side-effect of companies trying to eke out profitability in a market that is tightening up. Thirty years ago, technology work was the growing business that was displacing the typing pool. Today, it is in danger of becoming the next typing pool. Great post Matt. Yes, indeed, we have a lot to talk about. "Business as usual" doesn't work, it probably never did, but it certainly doesn't work now. Good review. I posted it around. One point, about Toyota's early strategy: One thing that helped Toyota make choices that played well for the future was that Toyota's markets at the time were in Japan and in the Far East, where smaller, more efficient, more affordable cars were the center of the market. In the US at the time, larger, more powerful cars sold like hotcakes because that is what *that* market wanted. GM was indeed responding to its market - in spades. When the oil crisis changed the economics of car ownership and Americans headed for more fuel-efficient cars (and cheaper ones because of the recessions of the 70s), Japan was already there, with appropriate cars ready to go. GM et al., even if they had decided to switch gears to radically overnight, would have had to take years to retool and rethink -- and did. GM et al. also didn't know if the reversal was near term or longterm -- nobody did -- which helped slow down their transformation. I'm not sure I would have acted differently had I been running one of the American companies at the time. Maybe the only truly wise thing to do in an era of such uncertainty would have been to rework the company's long-term plans and management style to be much more flexible and ready to react should things turn badly against them. But they didn't shift to flexibility, and things did turn against them. Meanwhile, Toyota's ability to react favorably to this market change looks a bit less like corporate wisdom and genius than it does like corporate leveraging its existing strengths to take advantage of a new market opportunity. Toyota didn't have to radically rethink 50 years of until-then-successful corporate strategy. Even GM would have been able to handle a situation like that. Maybe. Great additional historical context, Mac, I appreciate it. I'm not following the part about how he had an advance to write a book and had to return it; isn't this a book? doesn't it count? Hello Sharon - Cringley had an advance to write a /*different*/ book, and it was exclusive, so he had to publish the different book as his next major work. He was so excited about the IBM story that he turned the gig down.